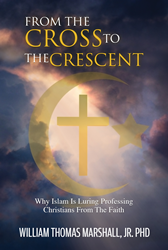 Within the pages of William Marshall’s new book, From the Cross to the Crescent($14.99, paperback, 9781545662014; $7.99, ebook, 9781545662021), readers will find a book that reveals the cultural, religious, and theological reasons why professing Christians are converting to Islam. Marshall believes within the next few decades, Islam in America will triple that of Christianity. Islamic influence is both a national and global phenomenon. With both mainstream and radical Islamic activities in America and across the globe, this book should attract readers from all cultural and religious demographics. William Marshall has Masters Degrees in Management and Divinity. He has an earned PhD in Education. He retired from the United States Navy and currently serves as a senior pastor and educator in theology, business, counseling, and education. Xulon Press, a division of Salem Media Group, is the world’s largest Christian self-publisher, with more than 12,000 titles published to date.From the Cross to the Crescent is available online through xulonpress.com/bookstore, amazon.com, and barnesandnoble.com.